The Central Reserve Police Force has published a Advertisement for below mentioned Posts 2015. Check below for more details. Educational Qualification : Candidates must passed Matriculation/ 10+2 or equivalent from a recognized Board / School. Age Limit : Aspirants has to attain age in between 18 years and 23 years as on last date of receipt of applications. 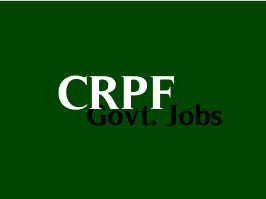 Application Fee: Job seekers has to pay application fee in the form of demand draft (DD) In Favour of DIGP, GC CRPF, New Delhi. For SC/ ST/ Female candidates : No Fee. Selection Process : Applicants will undergo through an Physical Standard Test, Sports Trial Test and Medical Examination for selection process. How to Apply : Interested Candidates may Apply Online Through official Website or send application form to address mentioned in notification for Offline mode.